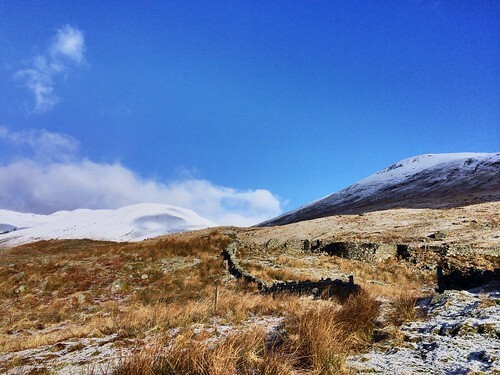 Alongside Ben Lomond, Ben Vorlich and Stuc a'Chroin are perhaps the two Munros easiest accessible from the central belt, which makes them very popular. While the usual way up is from Loch Earn to the north, a southern approach is, in my view, much to be preferred -- not only it takes one away from the crowds into a more remote feeling country, frequented mostly only by deer and birds of prey, but there is some exceptionally good running to be had on the south side of these hills. Limited parking is available at the end of the Bracklinn Falls road that leaves Callander by the golf course (NN 636 107). From there take the track by Braeleny farm all the way to the stream that flows down Gleann Breac-nic, and cross this on a bridge, then follow the other bank right (E) a few meters to the stream that comes from the reservoir above, and cross this (wet feet, except after sustained dry spells; the bridge still marked on OS maps has been swept away over a decade ago). Follow the access track to Arivurichardich. A stalkers path (see map) leads from the W side of the Arivurichardich bothy; follow it all the way to the bealach just W of Meall na h-lolaire. The path provides good running, though there are a few boggy sections that persist even through the driest spells. From the bealach descend NE into Gleannan an Dubh Choirein along the path -- the path virtually disappears in the bealach, but can be picked up again by locating the stream which it follows (see map), and runs well. Cross the stream at the the bottom of Gleannan an Dubh Choirein around NN 644 166, and head up the SSE ridge of Ben Vorlich. As you are negotiating the initial peat hags, aim for some scattered boulders slightly higher up. 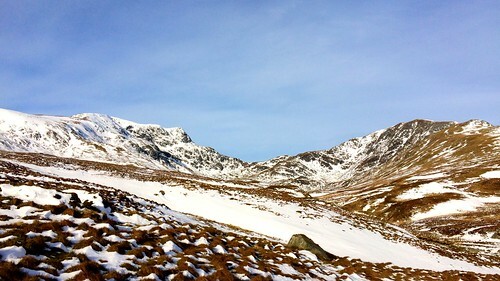 From there a faint but improving path follows the ridge all the way to the summit. 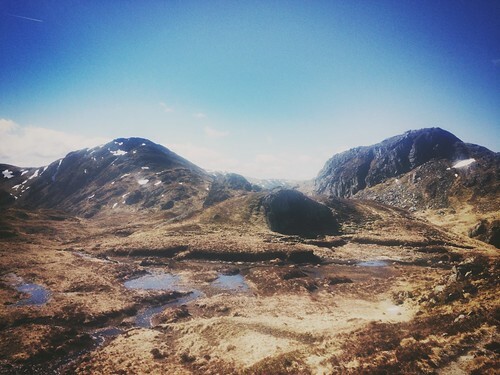 From Ben Vorlich, descend into Bealach an Dubh Choirein following the walkers path (running water can usually be found just under the steep descent), and cross the bealach to below the NE buttress of Stuc a'Chroin. A short scramble leads up the buttress -- the scramble is easy, with only one slightly awkward step, but the ascent is quite exposed, and can be intimidating, especially if wet; it can be avoided altogether, following an alternative path that gains the NW ridge from the N corrie of the Stuc. 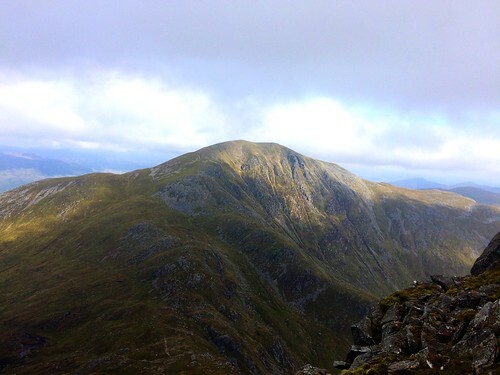 From the summit the SE ridge of Stuc a'Chroin provides first class running on a faint path, closing the loop back in the bealach below Meall na h-lolaire. 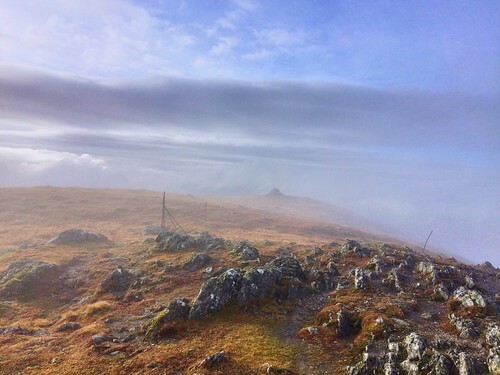 As good as the descent via the SE ridge of Stuc a'Chroin is, the ridge that connects the Stuc to Beinn Each is one of the best kept secrets of the lowland hills, and the good path (not on the map) provides excellent running (part of the Stuc a'Chroin hill race). If needed, running water can be found within fifty yards or so S of the path as it reaches a low point around NN 607 171 (there are no other good water sources beyond this point). From Beinn Each summit, head down the SE ridge and follow it to its end (NN 629 139). The grassy ridge, while tussocky at times, allows for good progress to be made (although not as fast as the SE ridge of the Stuc). At the end of the ridge, descend the steep grassy slope, heading somewhat E of the shielings; take extra care on the steep slope, avoiding a couple of rocky escarpments not shown on the map; the lower section of the slope is covered in bracken. Once off the steep ground, head for the access track following the Gleann Breac-nic stream (not on the map, part of the ongoing hydro scheme construction). Take the track back to the start.